The Legend of Texas Red This Three CD set tells the story of a young boy from Alabama who’s Mother sends west to live with relatives in Little Rock, Arkansas in order to try and keep him out of the American Civil War. From the minute sixteen year old T. Redford Slidell gets on the train to leave Alabama in 1860 his life becomes an adventure in turmoil and excitement of epic proportion as he travels thru life and the American West en route to becoming “Texas Red” the legend.The first two CDs contain the thirteen stories and fifteen songs that make up the entire “Texas Red” saga. The third CD contains only the fifteen songs. “Texas Red” is packaged in a double sized jewel box and contains a twelve panel booklet with credits and info on one side, with an old west style poster photo on the other. 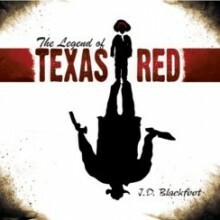 This one of a kind artistic presentation in music album and audio book combined, “The Legend of Texas Red” is already being hailed as J.D. Blackfoot’s crowning achievement in a career spanning half a century as a singer / songwriter / recording artist, and stand alone – one of a kind storyteller. Recorded at GRP Studios in Altamonte Springs, Florida with Wally Walton engineering, the principal players are: J.D. Blackfoot – Acoustic/Electric Guitar and Vocals. Bobby Caldwell – Drums. (Bobby played on the classic hit “Rock and Roll Hoochie Koo” with Rick Derringer, and been a part of, or worked with, such bands as “The Allman Brothers Band”, both “Johnny Winter” and “Edgar Winter”, and was a founding member of “Captain Beyond.” John Durzo – Fender Bass Guitar. (John has worked on many of J.D.’s projects over the course of their almost half a century worth of friendship and has also been a member in the bands “Strongbow” and “Money”.